In 2015, the share of youths aged 15-29 who were not in education, employment, or training (NEETS) was, on average, 15% in OECD countries, and high-school dropouts represented one third of these. As most dropouts remain out of employment for long periods of time, with lasting consequences for their personal and professional pathways (OECD 2016), this disadvantage tends to be very persistent. Among the many programmes that have been tried out for low-skilled young NEETs in the past 30 years, subsidised employment has been an important lever of employment policies, especially in France. However, despite the substantial public finance costs associated with the implementation of such measures, little is known about the effectiveness of specific interventions in easing school-to-work transitions among under-educated youths. Previous research suggests that private sector subsidies perform better than public sector ones (Heckman et al.1999, Kluve and Schmidt 2002, Card et al. 2010, 2015, Kluve et al. 2016). Nevertheless, doubts may remain as to the relevance of these results, as most of them have not been obtained in a framework that allows perfect control of selection effects. In a new study, we evaluate the efficiency of programmes for unemployed youth by measuring the chances of getting a callback from employers for high-school dropouts with various types of labour market experience (Cahuc et al. 2017). The method involves sending résumés of young people who, over a three-year period following their leaving high school, have been either (i) unemployed, (ii) unemployed with some temporary work experience, or (iii) continuously employed in non-subsidised or subsidised jobs in the market or the non-market sector, with or without a certification of acquired skills. In all cases, young applicants did not finish high school and never got further education before entering the labour market. We sent 5,388 applications over a period of six months in 2016 to actual job offers posted in France for receptionist and gardener positions. This strategy ensures that résumés can vary in one dimension only, which serves to identify the effects of different labour market experiences on the probability of receiving a callback. For instance, in our framework, the résumés of individuals who held a subsidised job in the past are identical in all respects to those who held a non-subsidised job. Since some otherwise identical job experiences are subsidised while some are not – which is specified in the résumé by mentioning France’s well-known youth employment programme, Emploi d’avenir – any significant stigma effect attached to contract subsidisation can be identified. The same holds for having held a job in the market or non-market sector, and getting a certification of skills or none. On average, the hardest-to-place youths in France exhibit a low callback rate of about 8% in response to their applications. To analyse the experimental data, we estimate a linear probability model that enables us to examine the effect of our fictitious applicants’ profiles on the probability of being called back by employers. Figure 1 reports the main results of our estimations. Having some patchy work experience during the period of unemployment does not improve the relative situation of the candidates compared with unemployed without any work experience during their long unemployment spell. This result is consistent with those of Farber et al. (2016) and Nunley et al. (2016), who provide evidence that low-level temporary jobs which do not match the previous education and employment experience of the applicants do not increase their probability of receiving a callback. A second finding that emerges from the analysis is that employment experience, either in the market or non-market sector, does not appear to increase applicants’ callback rate. For high-school dropouts, being employed for three years on fixed-term contracts, either in the market or non-market sector, subsidised or not, but without qualifying training does not improve the chances of a positive callback, even among employers from the market sector. These results are striking, as it is often claimed that getting a job in the market sector is a pathway to employment. They are nevertheless consistent with those of Fremigacci et al. (2016), who find that men unemployed for one year who apply for waiter jobs in France do not have lower callback rates than men employed on fixed-term contracts over the last year. However, when employment is paired with training providing certified skills, callback rates are significantly increased even if the vocational degree acquired corresponds only to the lowest level of certification available in France. Getting this vocational degree leads to a 42% rise in the probability of callback – a substantial effect on the employment prospects of youth with few or no qualifications. 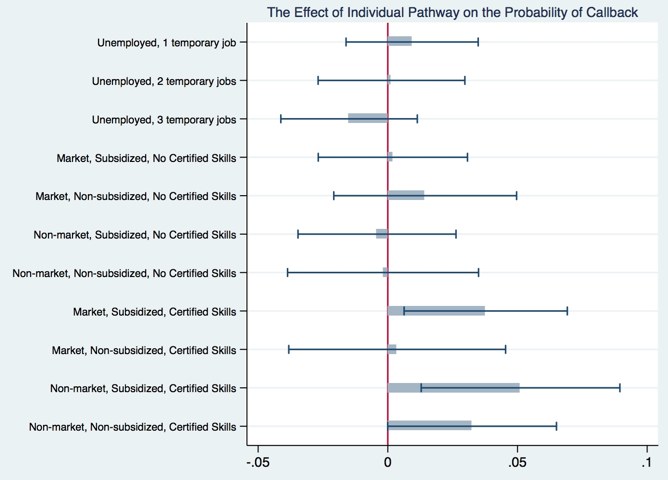 The impact of skill certification is large but very heterogeneous. Skill certification has a stronger impact when the youth occupied a subsidised job rather than a non-subsidised job, and the impact is even stronger if the job in which the experience has been certified was in the non-market sector. Indeed, given the design of the Emploi d’Avenir programme, which links subsidisation to the provision of training by employers, the monitoring of training of youth employed in subsidised jobs is likely stronger that in non-subsidised jobs. It is also likely that more time can be devoted to studying and training in the non-market sector than in the market sector. All in all, recruiters may expect youths who acquired certified skills in subsidised jobs in the non-market sector to be more skilled/effective than youth who acquired skill certification in other types of job. Our results are thus consistent with previous research showing that accruing work experience, even in the market sector, is not always sufficient to get callbacks more frequently for very low-skilled youths. They suggest that employment support measures, such as temporary jobs in the non-market sector or hiring subsidies in the market sector, should be conditional on getting a certification of skills at the end of the employment period, at least for previously unskilled youths. Furthermore, we also show that the effect of skill certification is more pronounced in tight labour markets where the unemployment rate is low. This finding implies that additional measures supporting the geographical mobility of youths could add important leverage to the employment effect of training. Cahuc, P, S Carcillo and A Minea (2017), “The Difficult School-to-Work Transition of High School Dropouts: Evidence from a field experiment”, CEPR Discussion Paper No. 12120. Card, D, J Kluve and A Weber (2010), “Active Labour Market Policy Evaluations: A Meta-analysis”, Economic Journal 120 (548): F452-F477. Card, D, J Kluve and A Weber (2015), “What Works? A Meta Analysis of Recent Active Labor Market Program Evaluations”, IZA Discussion Paper No. 9236. Farber, H S, D Silverman and T von Wachter (2016), “Determinants of Callbacks to Job Applications: An Audit Study”, American Economic Review 106(5): 314-18. Fremigacci, F, R Le Gall, Y L’Horty and P Petit (2016), “Le Conformisme Des Recruteurs : Une Expérience Controlée”, TEPP working paper. Kluve, J and C M Schmidt (2002), “Can training and employment subsidies combat European unemployment?”, Economic Policy 35: 409-448. Kluve, J (2010), “The Effectiveness of European Active Labor Market Programs”, Labour Economics 17: 904-918. Nunley, J M, A Pugh, N Romero and R A Seals (2016), “The Effects of Unemployment and Underemployment on Employment Opportunities”, ILR Review.